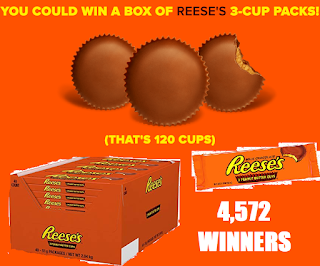 Reese's Peanut Butter Cups Instant Win Giveaway - 4,572 Winners Win a Full Box of 40 Packs of 3 Pack Reese's Peanut Butter Cups. Daily Entry, Ends 4/8/19. HERSHEY’S 2019 REESE’S MARCH MADNESS INSTANT WIN GAME (“GAME”) OFFICIAL RULES. PRIZES: There will be four thousand five hundred seventy-two (4,572) prizes available in this Game. Each prize is a box of forty (40) Reese’s three (3) packs. Approximate retail value (“ARV”) of each prize is $60.